Flings Bins are really cool garbage cans that look NOTHING like your ordinary garbage can. They are convenient and super easy to use. One of the great things that sets these trash containers apart from all the rest is the fact that they are made out of biodegradable and recycled products, making them eco friendly! So, while you are busy showing off your cute trash bin, Flings Bins are working hard to make sure you are given the best products. We are committed to creating innovative new eco trash can products that make your life easier while also taking close care of our world. Flings containers make recycling and trash management more attractive and fun for your events, which is something everyone can agree on. But what you may not know is that we are continuously working with material suppliers and trash haulers to ensure the highest use of recycled materials in our products, and make Flings evermore compatible with our country's trash infrastructure. I am not a "tree hugger", but I do like to help take care of our planet. I do care and do want a safe and healthy environment for my children. So, that is why I am so glad to be able to talk about Flings Bins with you all today! For this review I was sent two Flings Bins. I was sent the All Occasion Woman's Day Limited Edition Bin and the Gingham Picnic Bin. Both of these bins are super cute and very easy to use. All you do is open the packaging and pop open the bin. Then, there are two "supports" on either side of the interior of the bin that you straighten until you hear them "pop". Voila!!! Your bin is set up and ready to use! How easy is that! No fancy instructions, no complicated design. SO easy! These are definitely my kind of bins! Other than trash, I can think of multiple uses for my Flings Bins. I could use mine for toys, dirty clothes, blanket storage, wrapping paper storage etc. I actually decided to use one of my Flings Bins for my plastic bag storage in one of my kitchen closets. Here is what my closet looked like before using my bin... and here it is after! I love how it looks so organized and clean! They are 13 gallon sizes which really gives you tons of room to work with AND they are extra strong and leak proof! I LOVE it. All of the Flings Bins are certified green by the Sierra Club Green Home and will hold up to 60 cans or bottles...which is great. These bins also have drawstrings to help you close and carry your garbage/stuff when the bins are full. No mess! YAY! 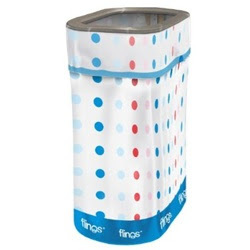 Fling Bins are available to buy either on their website, Amazon or at select stores near you. (You can check which stores by entering your zip code on the Flings Bins website.) Pricing is super affordable as well. So, in my opinion...Flings Bins are really great products! The innovative and fun designs dress up any occasion and are very practical. Because they are leak proof, you can throw just about anything away in them...or use them for storage for other things. Flings Bins has offered to give away two Flings Bins in the design that I chose, to two winners! How great is that!?! Here are the entry guidelines and options. Mandatory Entry:Visit Flings Bins and tell me which Bin you like the best. You do not have to be a blogger to enter, but you must have a valid email where you can be reached should you win. If you do not leave an email address, it must be where I can easily find it. This giveaway is open to US residents (except Hawaii and Alaska) and will end 4/6 at 11:59 pm EST. The winner will be chosen using random.org and will be notified by email. The winner will have 48 hours to respond, or another winner will be selected. 5. "Like" Flings Bins on Facebook. 2 entries, so 2 comments. Disclaimer: I received no monetary compensation for this post. I did receive two Flings Bins for review purposes. All quotes are from the Flings Bins website and email. All thoughts and opinions are mine. I like the celebrate bin! I follow you on GFC - e-mail is on my profile! i LOVE this product! what a great idea!!! i like the BBQ Bin the best! I think the basketball hoop bin is hilarious! I like the Black All-Occasion Trash Bin. Thanks! I love the Basketball Hoop Trash Bin. I like the BBQ bin!! These are so neat! my fave is the celebrate bin! I love the Celebration Bin. I like the basketball hoop trash bin! I like the recycle bin and the basketball hoop trash bin. My favorites are the Celebration and the Recycle Bins! The All Occasion Woman's Day Limited Edition Bin looks very nice! I tweeted about the giveaway at http://twitter.com/likwan/status/55840921736065024.